After months of anticipation, yesterday we installed the glass panels at The Upper Room. The wait was long but it was worth it — I am thrilled with the results. The Upper Room is a memorial designed to honour my mother and her beliefs. It’s a tribute to family and to the traditions I grew up with in Richmond, Virginia, when classically symmetrical architecture, brick, and boxwood shaped our streetscapes and our view of the world. From inception, brick and boxwood were essential elements of the design. So was a sense of embrace. I wanted the area to include something that felt like a hug from the out-stretched arms that always welcomed me when I returned. The hardscaping for The Upper Room was completed last summer but I couldn’t go on to the next step until the glass panels were installed. Genealogy was important to my mother so representing family was another key component. I played around with the idea of making a literal family tree but everything I sketched was too complicated and too busy. Yet the idea of a tree stuck. If not a family tree, what about an actual one? But what kind of tree, and would it have the necessary impact, situated as it was in the midst of a forest? I doubted it. So if not a real tree, what about the image of a tree? Immediately the idea felt right. The tree would be a flowering dogwood. Two groves of stately white dogwood (Cornus florida) grew outside the first house I remember, and dogwood is the Virginia state flower. I asked my friend, the Montreal artist Mary Martha Guy, to draw the tree and her design captured my heart. 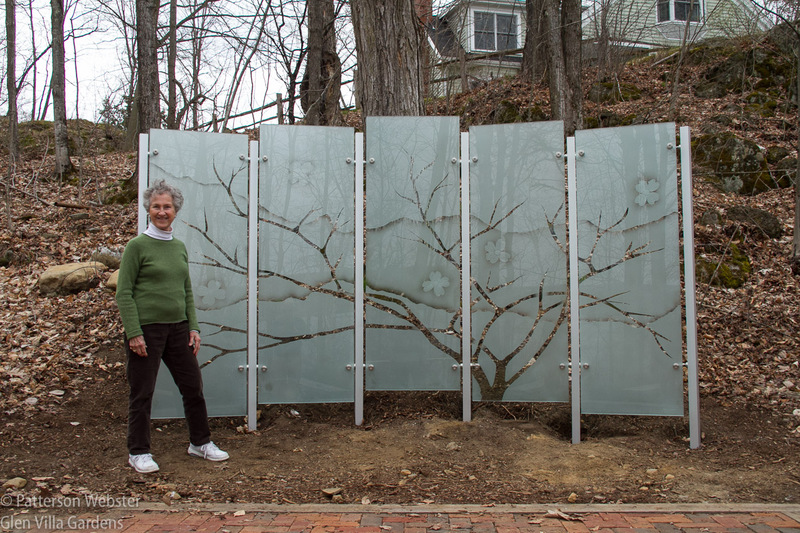 Mary Martha Guy’s beautifully spare design shows the outline of a dogwood tree, with five over-sized flowers positioned in a gentle curve. Even before the drawing was done, I knew I wanted it to appear on glass — the transparent, translucent and reflective qualities of glass seemed to fit the idea behind the project. 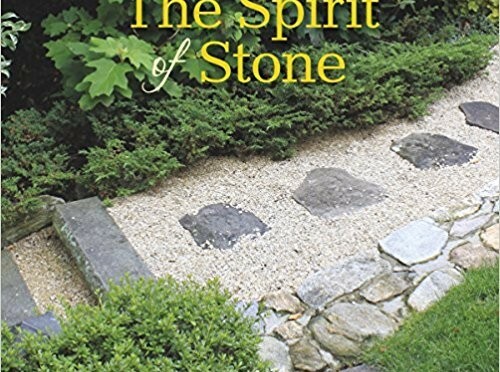 It was easy to imagine the outline of a tree etched or sandblasted into glass. But I quickly realized that I wanted to flip that around. Instead of picturing the tree on the glass, I wanted to picture its absence. 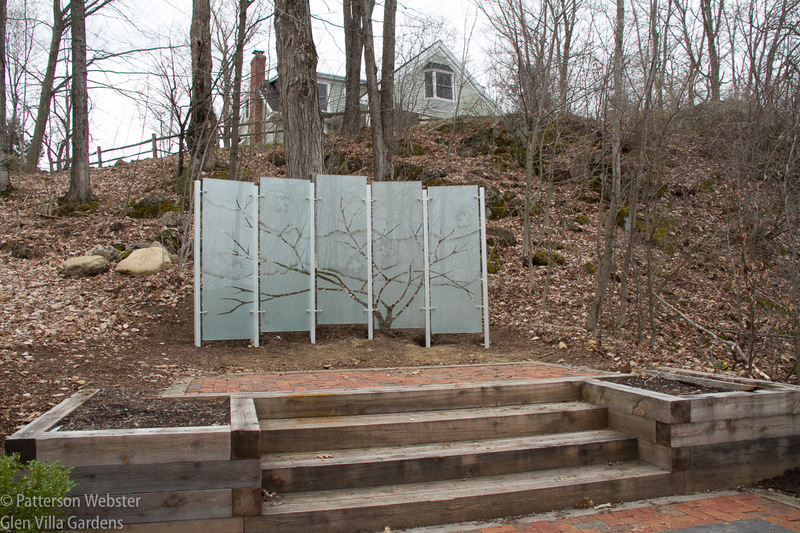 I wanted the shape of the tree to be clear glass and the remaining space to be sandblasted. 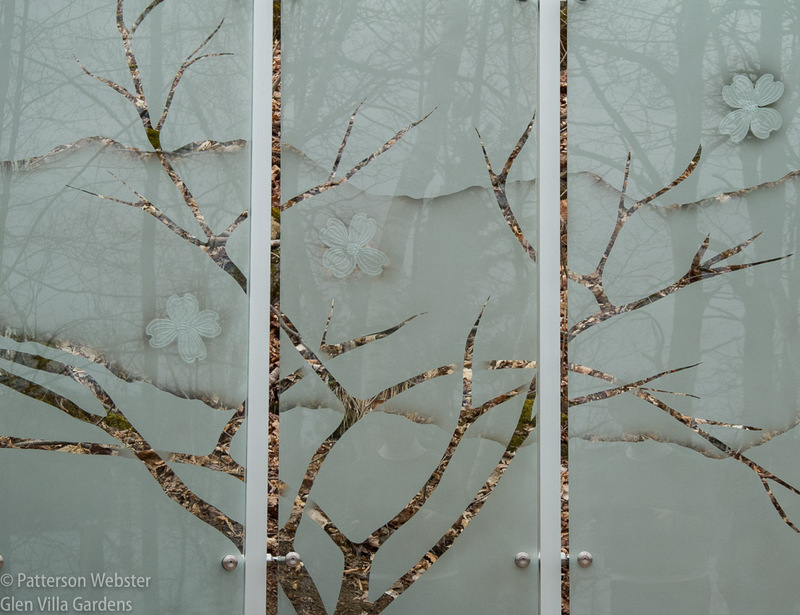 Clear glass would allow a view of the real trees in the forest behind, an idea I found appealing, and the empty tree-shaped space representing Virginia and so much more would add an air of poignancy. Finding someone able to do the work as I wanted it done took time. But Deirdre and Holden Collins at Vitrerie VM and Peter Collins Design in Montreal were the ones. We worked together to find the right hardware. That took time and getting everything in place took more. When we were ready to go, the ground was deep in snow. Yesterday, though, was perfect — warm and sunny. Work began early as the posts to hold the panels were installed. Posts are anchored in the ground below frost level to prevent shifting over time. They form an arc like arms about to give a hug. Each post had to be level and straight and getting this right took an hour or two. Then the first panel was carried down the hill. 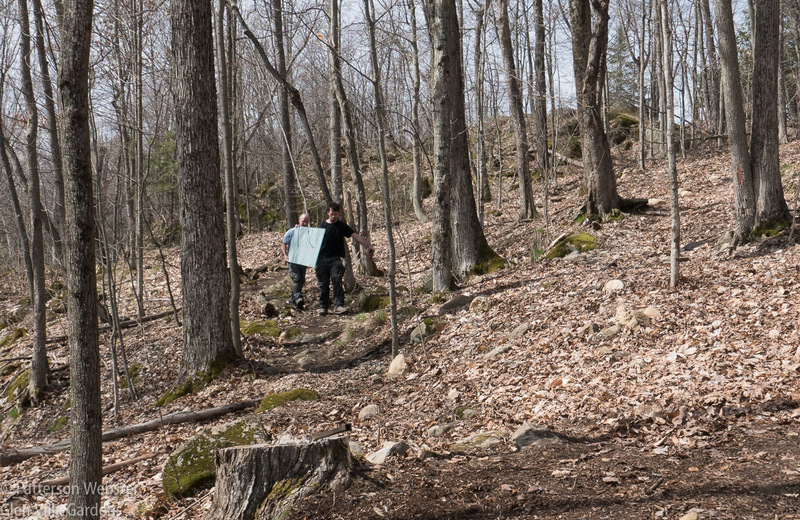 Watching the panel being carried through the woods over rough, uneven ground was nerve-wracking. What if they dropped it? This first panel was the middle of five. Positioning it perfectly was crucial — if it was off-centre, everything that followed would be wrong. Mary Martha, her husband Jean-Eude and I chatted away while the experts did their job. Mentally I was biting my nails the whole time. 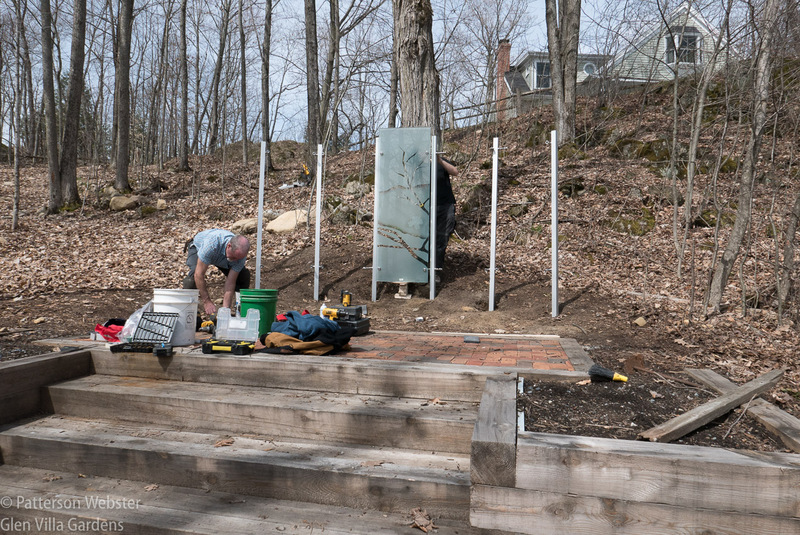 By lunchtime, three panels were in place and everyone was starting to relax. And to become excited. The drawing was coming to life. Mary Martha was beginning to smile. Even to laugh. With all five panels in place, the idea I had in my head, that Mary Martha had translated to a drawing and that Didi and Holden had sand-blasted onto glass, was finally there in front of me. How different things will look at different times of day and in different seasons. How different it will look once the trees leaf out. Our daughter’s house at the top of the hill will be hidden then. The impact is more than I had hoped for. 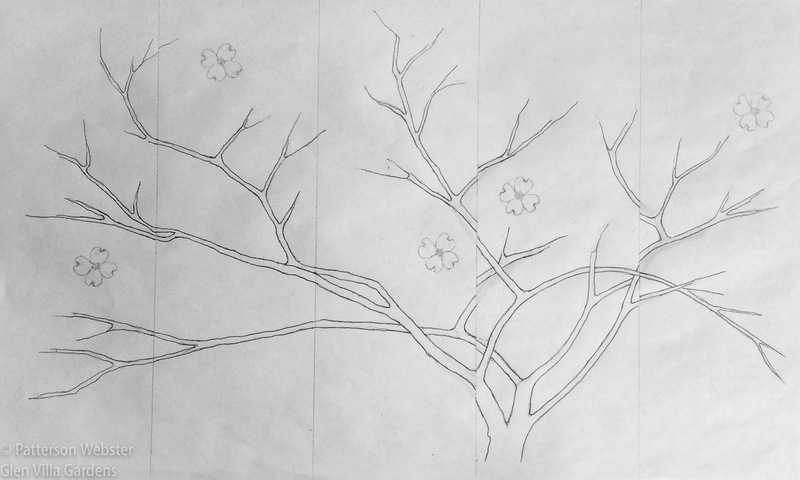 The details of Mary Martha’s beautiful drawing have been translated with enormous skill to show overlapping branches that end with a delicacy that reminds me of Chinese ink paintings. The shadow line that Peter Collins suggested adds another level of nuance. I love how the dead leaves twinkle through the clear glass, making the empty space look like the trunk of an actual tree, and how the sand-blasted areas show shadowy trees behind the glass and reflect the trees that were behind me when I took the photo. The area is far from finished but the biggest step is over. Today we pulled up the boxwood that were heeled in when we began work on this project in October 2015. We cleaned them up, gave them a preliminary trim and replanted them along the sides of the brick paving. Amazingly, after 18 months of neglect, they still look good — a bit scraggly, perhaps, but I’m confident that time and good growing conditions will remedy that. Or perhaps, as Mary Martha said, their sprawl suits the forest around. Boxwood line the outside edge of the central brick area. 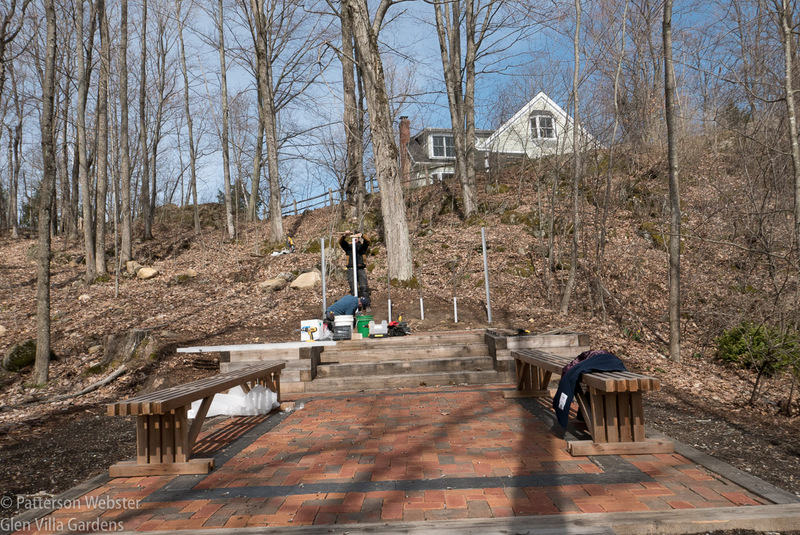 Benches like church pews will offer a place to sit and admire the real trees and the sand-blasted one. I won’t use many other plants — The Upper Room is in the midst of a forest that provides its own beauty — but I do plan to use columnar trees that will rise like pillars from the corners of the symmetrical space. 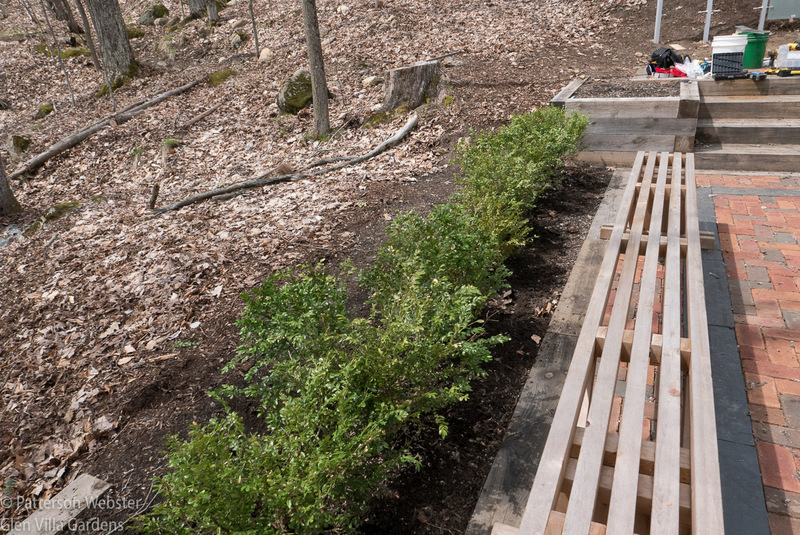 I’ll add a low-growing ground cover around the trees, the boxwood and at the base of the dogwood panels — possibly heuchera or heucherella, possibly lamium or vinca, possibly partridge berry (Mitchella repens). 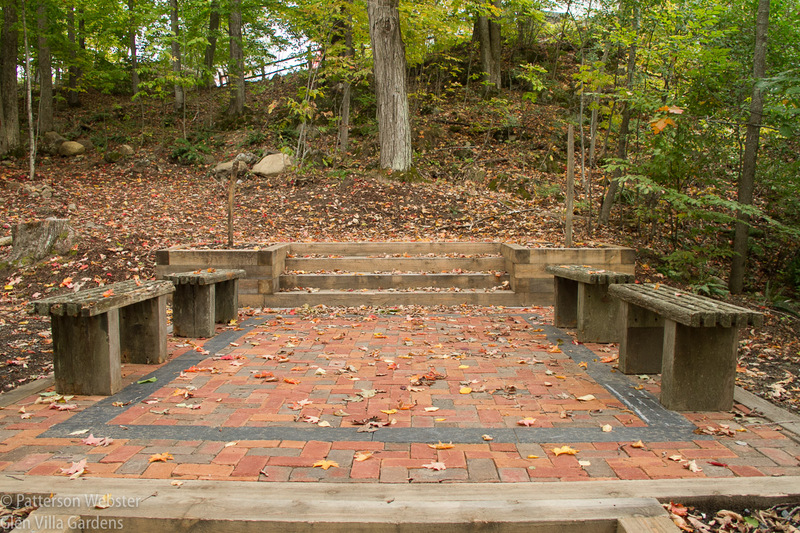 And I’ll design two benches that will provide a place to sit, to replace the ones shown in the photos above. Today I settled on their dimensions and the idea for the design became clear. Finishing The Upper Room was one of my goals for 2017. I’m confident now that it will be done. 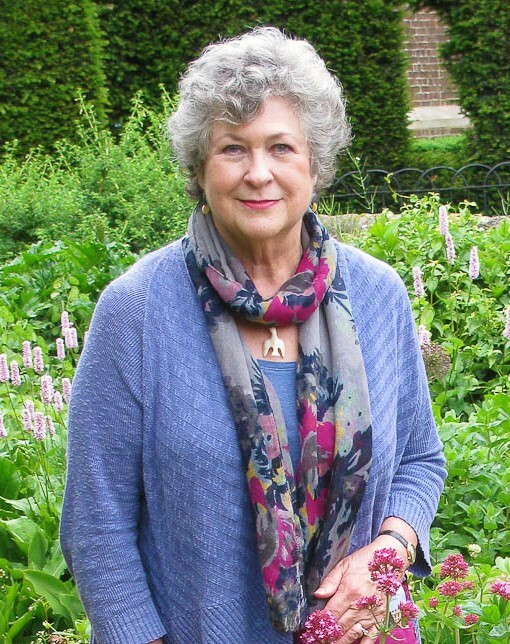 My mother would be pleased — she always finished what she started. 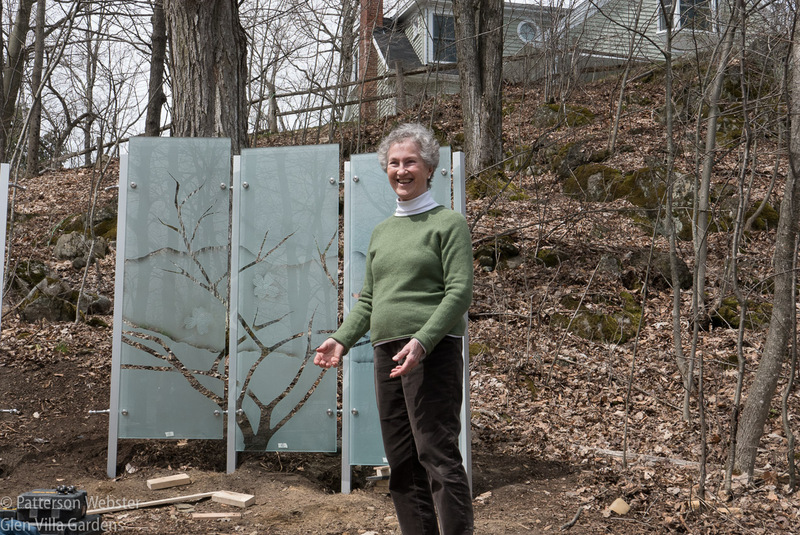 Mary Martha Guy stands in front of her beautiful drawing on the stunning glass panels made by Vitrerie VM.